Fit Fluential Mom: Tips to Avoid the Holiday Weight Gain! Every holiday season, you try the same old drill. Stuffing? Don’t need the extra carbs. Eggnog? No amount of nutmeg can hide all that fat and alcohol. Pumpkin pie? Too many calories… delicious, creamy decadent calories. Nope, this holiday season, you’re going to stick to your nutrition goals! But have you ever been successful in doing that? How many times have you gazed miserably at the dessert table, avoiding it like the Plague, only to eventually give in? Come January, you’ve eaten everything you said you wouldn’t — and then some. You’re not alone. The average American ate 32% more over the four-day Thanksgiving weekend alone. Despite your best efforts to keep unhealthy food out of your line of sight, with all of the social events, candy corners at the office, and tasty sabotages (i.e. gifts, from friends), you simply cannot control your environment as well as you can during the rest of the year. Regardless of all the oaths and intentions, most of us still gain weight during the holidays. So how do you stay 100% committed to your nutrition plan during the holidays? You don’t!Trying to stay completely on track during the holidays may be the exact thing that causes you to gain weight. There are several possible reasons for this. The first is the Forbidden Fruit Effect (or Theory of Psychological Resistance). You always long for whatever it is you can’t have. The deprivation itself makes holiday food all the more tempting. Your brain also perceives that you’re being punished and you end up in a battle between the side of you that has promised to stay in control and the side that wants no part of the food restriction. Guess which side typically wins? The second cause is the Law of Dominant Thought, which says the focus of your thoughts will affect your choices, behaviors, and achievements. There is a reason why health experts recommend you clean out your cupboards of unhealthy foods. Out of sight, out of mind right? Unfortunately, during the holidays, indulgences are constantly in your sights — and therefore at the forefront of your mind. When you spend the day obsessing over not snacking on peppermint bark, you can’t be surprised when you go through the whole tin in one sitting. Where your mind goes, energy flows. Constant exposure to unhealthy foods, combined with the alcohol that often flows freely at holiday events, can make you more likely to overeat. 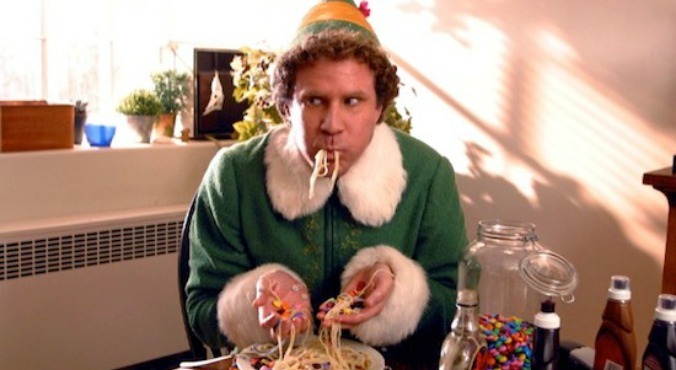 The third culprit that contributes to holiday binge eating is stress. The planning, cooking, decorating, and managing schedules of the holidays may push you to crave comfort foods — anything high in fat, sugar, and/or salt — that temporarily calm your nerves. But, in the end you end up more stressed from the disappointment of not being able to fit into your “skinny” jeans. So, now you know what’s going on in your head during the holidays. So how can you overcome all of these influences and keep off added holiday pounds? The solution is the Holiday Hall Pass. This sweet indulgence allows you to make the most of the holidays, with five safeguards to prevent you from getting too crazy. These safeguards — let’s call them holiday helpers — create an environment that evokes positive emotions that calm the negative ones you experience when you attempt to deprive yourself. Holiday Helper #1: Exercise a little bit every morning. The first little helper is a pre-performance morning exercise routine. Spend at least 20 minutes doing anything active: FOCUS T25, PiYo, walking the dog, whatever it is that you do. During typical weeks, fitness experts recommend one day of rest, but during the holidays, it’s best to be active every single morning to stay consistent. It can be an all-out workout or a simple physical activity to create a positive tone for the day, helping you keep off the stress. Holiday Helper #2: Keep a journal. If you simply write down what you do and feel throughout the day, you’ll become aware of your choices, causing you to continue to make good ones. Through writing, you bring a little logic back into the equation, which helps you overcome your emotional tendencies. For maximum results, journal immediately before you show up to a holiday event. Write down what you’ve already eaten that day and how your choices have made you feel. If you’ve already chosen to eat unhealthily throughout the day, the awareness you bring through this journaling process will help you to create a plan of action for the upcoming event. It’s not about saying to yourself “Well, I’ve already ruined this day so I’ll start again tomorrow,” but rather asking yourself what one positive thing you can achieve at this event to feel good about yourself and the choices you made. On the other hand, if you have been eating healthily so far and are energized and proud of yourself, bringing those thoughts and feelings to the present moment will enhance your opportunity to be mindful about what you choose to eat at the holiday event. Holiday Helper #3: Don’t let yourself get hungry. You should graze every 2–3 hours. Whether it’s a full meal or just a light snack. Keeping your metabolism up and your stomach satisfied will prevent you from becoming too hungry. You won’t end up with plates of food you have to haul away with a forklift if you aren’t starving when mealtime finally rolls around. Holiday Helper #4: Set holiday indulging intentions for yourself. Remember, this isn’t about denying yourself anything delicious; your intentions simply set the scene for an enjoyable-yet-controlled feasting experience. You can choose to allow a small indulgence with each meal, whether it be one piece of cake or a few little cookies. You can also choose to go ‘all out’ for one special night. Also use attentional cues — pre-made questions pre-programmed and scheduled in your smartphone to help you stick to your intentions. Some examples of attentional cues are: Are you proud of your food choices so far today? Would the people who want you to succeed be happy with your choices? Are you giving all the effort you can to following through on your plan? Does this food taste better than how your body looks/feels when you’re healthy? Feeling guilty about indulgences only amps up the stress, leading you right back to the second and third serving of turkey and cranberry sauce. Enjoy your holiday and indulge without beating yourself up.